This article was originally published on Mother Jones and is republished here as part of the Climate Desk collaboration. The Nebraska Public Service Commission removed a major regulatory roadblock to the construction of the controversial Keystone XL pipeline on Monday. Though that might seem like the final judgement in the nine-year battle waged by the US environmental movement against it, nothing about the fate of the once-dead, then-revived pipeline has ever been certain. Even though the commission approved the pipeline in a 3-2 vote, a number of hurdles for TransCanada, the parent company, still remain, and environmentalists vowed to exploit every single one of them. “This has always been a fight against the odds,” 350.org founder Bill McKibben, a leading anti-Keystone activist, reminded reporters in a call Monday. The Nebraska commission gave TransCanada a green-light for a route through the state, one that does not cross Nebraska’s sensitive sand dunes but is further east from where TransCanada hoped to build. That could change or delay the company’s agreements with local landowners. “As a result of today’s decision, we will conduct a careful review of the Public Service Commission’s ruling while assessing how the decision would impact the cost and schedule of the project,” TransCanada president Russ Girling said in a short press release. Protesters hold up signs in opposition to the Keystone XL pipeline. Anti-Keystone activists noted that the caution in this statement reveals that activists aren’t defeated yet. TransCanada may need to go through another round of the approval process from state and federal regulators for the alternative route. Then there are ongoing lawsuits from indigenous communities and landowners affected by the pipeline. Activists cite remaining concerns that the state’s large Ogallala aquifer is not safe from future spills, and lawsuits continue against the Trump administration for approving TransCanada’s cross-border permit. President Trump issued an executive order earlier this year urging the Army Corps of Engineers and the State Department to approve TransCanada’s applications; not long after, they did. It’s been nine years since the parent company TransCanada first requested a federal permit for the tar sands pipeline—which, they said, would be able to transport up to 830,000 barrels of crude oil a day at peak capacity from Canada to refineries in the Gulf. Last week, the pipeline that TransCanada once billed “the safest pipeline ever constructed on American soil” spilled 210,000 gallons of oil in South Dakota. According to the Omaha World-Herald, TransCanada said it won’t decide until December whether the project is still financially feasible. “Keystone XL will never be built,” Jane Kleeb, Bold Nebraska founder and leading anti-Keystone activist, vowed on Monday. “We must protect the Sandhills and Ogallala Aquifer from a risky export pipeline and eminent domain abuse.” She noted that “TransCanada was already on thin margins to get their pipeline in the ground,” and that they should be forced to comply with the reconfigured route to protect both the Sandhills and the water. Compared to other sources of oil that American refineries might use, the State Department estimated in 2014 that tar sands would be about 17 percent more polluting on average. More recent estimates from the deparment of tar sands pipelines suggest that the greenhouse impact would be even worse than that. 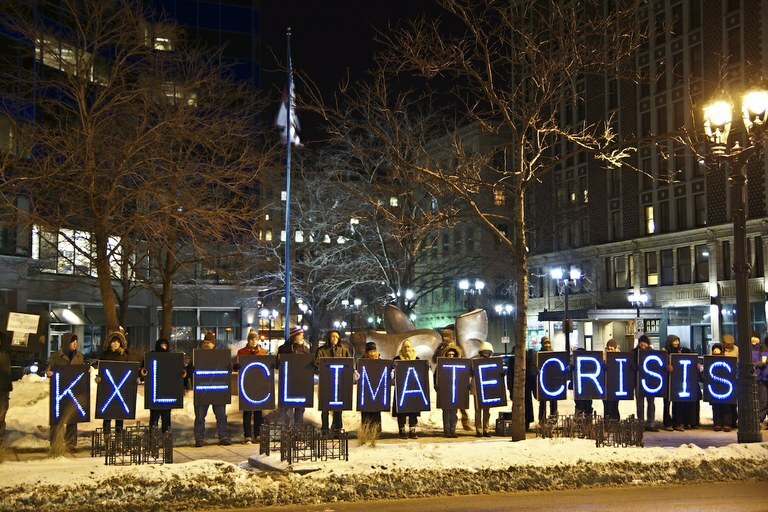 The pipeline has become synonymous with environmental activism in the past decade and was considered a way for politicians to demonstrate their seriousness about combatting the effects of climate change. Keystone was seen as an all-or-nothing prospect that would singlehandedly drive up greenhouse gas emissions by speeding up the development of the Canadian tar sands. Oil prices are too cheap in the foreseeable future to make other types of transport for the crude oil profitable.